I don’t usually eat granola bars, I find them too sweet for my taste and I don’t like to eat food with an ingredient list that I can’t pronounce. I do however like to make them at home where I can control what goes into them. These are full of toasted oats, quinoa, flax meal and chia seeds so they have a nice amount of protein in them. I like to toast the oats in butter before assembling them but you could substitute coconut oil instead. 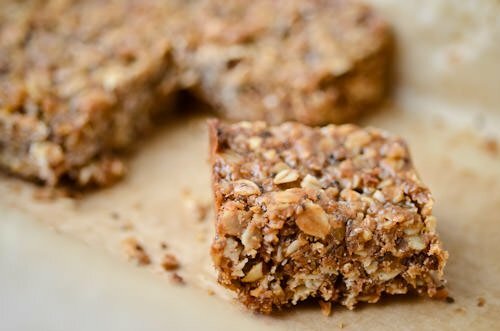 The butter adds a delicious nutty flavor to the bars and gives them great texture. I think of these as a sweet treat to replace an afternoon cookie or candy bar so I don’t mind the addition of the butter. Pre-heat the oven to 325 degrees. Lightly coat a 8 x 8 baking pan with cooking spray or line it with parchment for easy removal of the bars. In a medium skillet melt the butter or coconut oil over medium heat and add the oats. Cook over medium heat stirring occasionally until the oats start to turn golden brown. Transfer the oats to a medium mixing bowl. Add the quinoa, flaxseed, chia seeds, cinnamon and hazelnuts and hazelnuts to the oats. 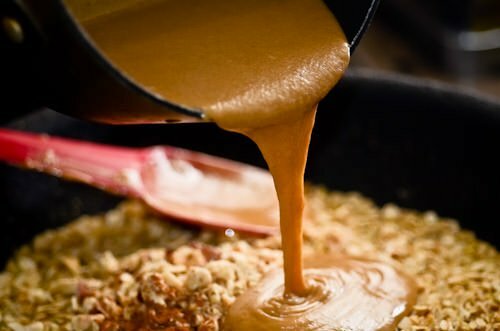 In a small saucepan add the honey and peanut butter and bring the mixture to a boil, stirring constantly until the mixture comes to a boil. 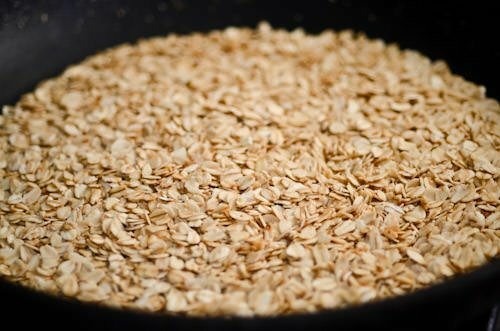 Pour the syrup over the oats and using a spatula make sure that all the ingredients are evenly coated. Spread the mixture into the prepared pan and bake the bars for 20 to 25 minutes until the bars are golden brown. Let them cool completely, slice into 12 portions and serve. I wondered if you have the nutrition information on these. I have made them several times and I love them! But it would be great to know the fat, caloric and protein content if you know it? Thank you! I’m so glad that you enjoy them! 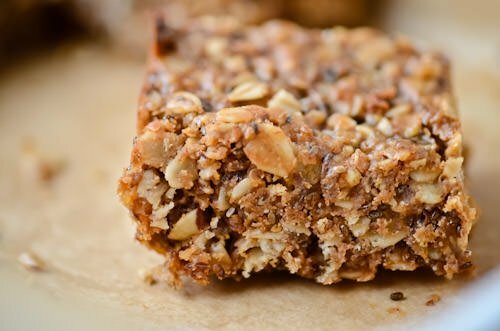 The granola bars have approximately 166 calories per serving with 9 grams of fat, 3 grams of protein and 9 grams of sugar. Hope that helps! These look delicious! Is the flaxseed meal necessary? Is there a substitute? 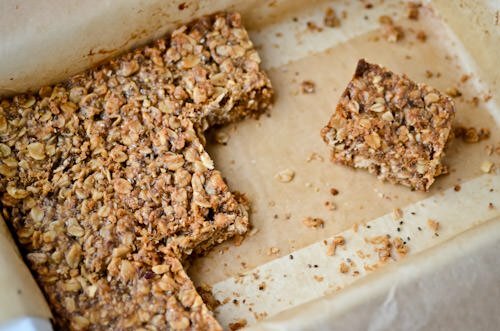 You can make them without the flax seed and it won’t make any difference to the end result. You could add some hemp or sesame seeds instead if you are looking for some added protein. I hope you like them if you try them! I would omit the peanut butter entirely but you can substitute it with any other nut butter you can eat. Almond, cashew or sunflower butter would all work. If you can’t eat any nuts at all coconut butter would also be a good substitute. I hope you enjoy the bars if you try them!